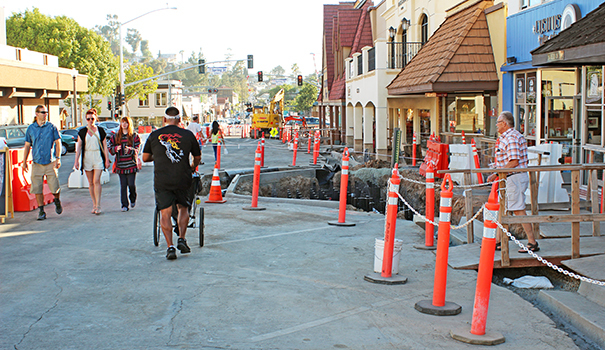 The Downtown Village Streetscape Improvement Project continues to disrupt the flow of both pedestrian and vehicle traffic in La Mesa’s central core, but customers seem to be enjoying the area’s shopping, drinking and dining options anyway. Work is currently underway on the north side of La Mesa Boulevard between Spring Street and Palm Avenue. After construction workers had gone home on a recent Wednesday evening, dozens of people walked on rickety plywood sidewalks over deep open trenches to reach Cosmos Coffee Café, Hoffer’s Cigar Bar, Swami’s Café and the Goodwill store. For more details and updates on construction progress, including details on the new street tree plan, visit cityoflamesa.com/downtownvillage. La Mesa homeowners will have to pay an extra 68 cents a month to get their trash and recycling picked up beginning in July. The City Council unanimously approved the rate increase at a June meeting. The new residential rate is 3.6 percent higher than the previous rate, which has been $19.09 per month since July 2013. Rates are also going up for commercial customers, from $99.29 per month for one bin to $100.74 — a 1.5 percent increase. The new rates will remain in effect through June 2017. Part of the reason for justification for the rate hike was a significant decline in the value of some recyclable materials, said Steve South, EDCO president and CEO. South pointed to a number of factors that impacted worldwide demand for recycled materials: the strengthening of the dollar against other currencies, an economic slowdown in Asian countries and the recent labor unrest at California ports. Revenue from the sale of recycled commodities is factored into the rates customers pay, so when commodity revenues go down, it impacts the rate, South said. There’s another culprit, too, according to South: people scavenging recyclable materials out of bins on the street. Even with the 68-cent increase, La Mesa still has the fourth-lowest refuse collection rate of the 17 cities in San Diego County that charge customers for trash removal. National City has the lowest rate at $18.09, while the city of San Diego provides free refuse collection to all single-family homes. La Mesa city councilmembers had nothing but praise for EDCO at the meeting. Councilmember Ruth Sterling said the increase was “very modest.” She thanked the company for its contributions to the community. “We’re lucky to have EDCO,” she said. La Mesa resident Mark Neville has been named executive director of the San Diego Bowl Game Association, the nonprofit organization that produces San Diego’s two college football bowl games played annually in December at Qualcomm Stadium, the San Diego County Credit Union Poinsettia Bowl and the National University Holiday Bowl. Neville has been with the San Diego Bowl Game Association since 1991. He previously served as associate executive director, overseeing sponsorship, marketing, advertising and media relations efforts. He succeeds Bruce Binkowski, who had been with the association for 37 years, spending the last 14 as executive director. Binkowski is currently serving as a consultant during this year’s transition. The San Diego Bowl Game Association’s mission is to generate tourism, exposure, economic benefit and civic pride for San Diego and its citizens by producing the nation’s most exciting bowl games and festival of activities. During its 37-year history, the organization has generated more than $730 million in economic impact for the region. This year, kickoff for the Poinsettia Bowl will be at 1:30 p.m. on Wednesday, Dec. 23, and one week later for the Holiday Bowl at 7:30 p.m. on Wednesday, Dec. 30. Both games will air nationally on ESPN-TV and ESPN Radio. The Poinsettia Bowl will feature a bowl eligible Army taking on a team from the Mountain West Conference. The Holiday Bowl will match teams from the Pac-12 and Big Ten Conferences. Summer is the season for Grossmont High School class reunions. The Class of 1985 will have their 30-year reunion July 24-26. The Class of 1995 will have their 20-year reunion Aug. 1. The Class of 1975 will have their 40-year reunion Aug. 21-22. The Class of 1956 will have its 60-year reunion with alumni from El Cajon Valley High School on Sept. 13. The Class of 1965 will have its 50-year reunion Oct. 16-18. Visit GrossmontAlumni.net or call 619-668-6140 for more information on class reunions. Save the date of Oct. 16 for Grossmont’s 95th anniversary celebration.